Pacific Wonderland Koi Club had the honor to participate in Festival Japan, September 18 & 19, 2004, at Uwajimaya Plaza, Beaverton, Oregon. Our mission was to raise the community's awareness of the tremendous advancements and contributions, made by the Japanese breeders, to the world-wide hobby of Koi-keeping. And, we had a wonderful time doing just that! On Friday, September 17th, we set up 3 show tanks and prepared the water for Saturday and Sunday. We averaged 10 members working each day of the festival. The set-up crew from Hughes Water Gardens provided garden decor for our booths. We had beautiful urns with bubbler fountains, ornamental grasses, varieties of cannas, kiosks hung with artwork of local artists. It was truly beautiful. Thank you, Jill Woodmansee and your crew, for your inspiration and creativity and support. Saturday, September 18th, was cold, windy, rainy; but that didn't deter people from attending the festival. We Oregonians are a hardy lot! Sunday, September 19th, was overcast, but dry and mild. Several hundred people attended both days. On Sunday, we had people lined up 2-3-4 deep to view our Koi. We answered their many questions. It was great fun! Rick & Judy Ramento exhibited 4 Koi from their pond; and Dale & Sharon Richardson exhibited 2 very large Koi from their pond. In the third tank, Wayne King exhibited several varieties of fancy, exotic goldfish, since some of our members have goldfish as well as Koi. Wayne -- your darling little critters stole the show! Everyone was enchanted with those puppy-dog faces. The Koi received ooohs and aaahs; but the goldfish brought forth squeals of delight from the children. We had coloring pages of Koi for the children to take home. Over 175 were handed out! We had Koi stamps to give the children "tattoos", but the downpour made that impossible. We also had planned to show videos of the All Japan Koi Shows, but we felt that we should forego that because it was so wet! Saturday was like a monsoon! But, we still had hundreds of people visit our booths both days. Festival Japan was so exciting - over 34 booths in all. Our booth was next to the Consulate-General of Japan booth. 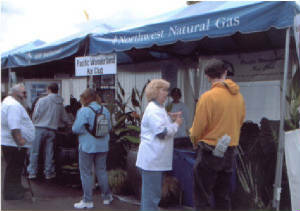 The food vendors offered delicious samples, as well as complete meals. There were karate exhibitions throughout each day. 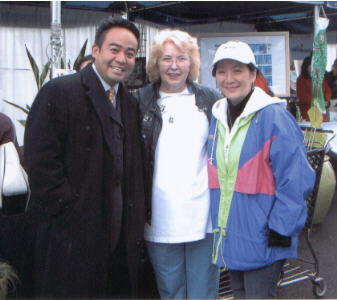 Joel Iwanaga, a reporter for KOIN News 6 was the M.C. on the main stage. He graciously made several announcements about our PWKC exhibit. The entertainment featured all aspects of Japanese culture - traditional music, taiko drums, ceremonial samurai sword demonstrations, and a Tokyo-style nightclub band. The children from the International School delighted us with songs and dances. Joel Iwanaga became an honorary member of our breakdown crew. Thanks Joel, for taking time for pictures with us. The Japan-America Society of Oregon was so pleased with our exhibit. We have been invited to take part in this wonderful event again next year. All we could say is, "We accept!" Sponsors are already committing to help us. Sayonara until the third weekend of September, 2005!